Welcome to second portion of our two-part series examining the transition from the FCS to FBS. In part one we looked at how teams have fared in the past. In this second part, we look at the teams best suited for the transition and also look at a few other teams. To recap part one briefly, we looked at the schools that transitioned from FCS to FBS since 1987. The teams that performed the best were teams that had multiple playoff appearances in the final five FCS seasons. The second best group was the new programs followed by teams that had one or no playoff appearances in the final five FCS seasons. We will make some assumptions about each team below that may or may not hold true if these scenarios in reality. For one, we look at each team separately and do not take into account all the dominoes from a potential realignment with our other teams. That would be far too time consuming to consider. Secondly, geography and travel are big components of the analysis. We look first at which geographical area would be best and then look at the additional travel required if they were to move conferences. Finally, keep in mind that while these teams would see increased revenues after they moved, they would also see increased costs in the form of stadium upgrades and travel for other sports would increase among other factors. Now we can look at potential jumpers and new programs with the criteria we laid out in the first part. 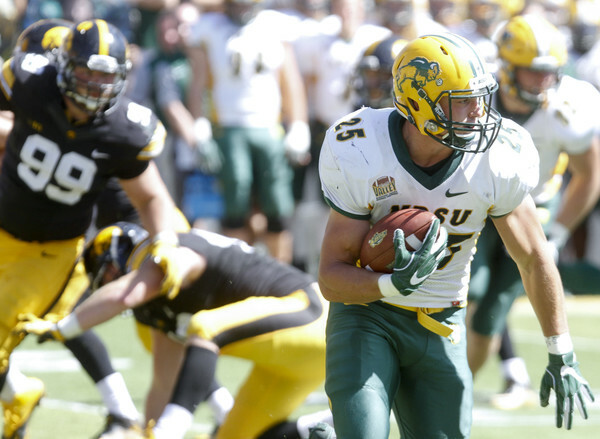 North Dakota State is the first team discussed any time FCS to FBS transitions are explored. The Bison have only won six of the last seven FCS National Championship and have clearly been the best team of the decade at the FCS level. There is one issue that really hurts the Bison and that is location. NDSU is currently the most northern member of the Missouri Valley Football Conference until 2020 when North Dakota joins. NDSU is geographically awkward if they were to move up to the FBS. 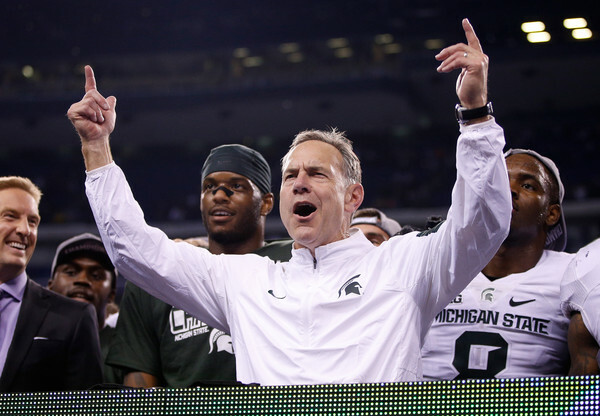 The best fit would be the Big 10 especially in terms of their location and style of play. However, the Bison would probably have to prove themselves at the FBS level first which would put them in the Mountain West. Again, this is not exactly ideal. Also consider the Fargodome, which has a capacity of 19,000 for football. They would have to upgrade the stadium to accommodate the increased number of fans. That would take money, which the Bison would recoup over time, but what about the additional travel costs not just for football, but also the other sports? Verdict: We would love to see North Dakota State make the transition, but it does not seem likely given the logistical constraints. Here is another FCS powerhouse each year. The Bearkats have made seven straight playoff appearances with two National Championship losses to North Dakota State (those pesky Bison). Sam Houston State has one of the best offenses each season in the FCS and play in the Southland Conference. The Southland Conference is a wonderful geographical set up for the teams. All members are from Arkansas, Louisiana, and Texas, which is more than convenient. So where would they land if they went to the FBS? There are three conferences: The American Athletic Conference, Conference USA, and Sun Belt. The American Athletic Conference would place the Bearkats in the West along with Houston, Memphis, SMU, Tulane, Tulsa, and Navy. Navy is a horrendous fit for the West Division, which means that the AAC could balance the divisions by getting a second West team and moving Navy to the far more natural East. In this case, they would face six west opponents and two east opponents each season. Conference USA currently has 14 teams with seven from the West Division located in Alabama, Louisiana, Mississippi, and Texas. If C-USA expanded to 16 teams that would leave only one game per season they would face an East Division opponent (based on an 8 game conference schedule). They would also face that East opponent on the road once every other year. Not a bad move based on assumptions above. The Sun Belt is the final option and teams leaving the Southland Conference frequently find the Sun Belt as their FBS destination. The conference has been split into East and West Divisions among its 10 members. The West Division has teams from Alabama, Arkansas, Louisiana, and Texas. Based on an 8 game schedule, they would have to face two East opponents each year with one at home and one on the road. Finally, Sam Houston State would have to increase the size of the stadium from the current size of roughly 12,500. Verdict: The Southland Conference is a wonderful spot for Sam Houston State right now. If they were dead set on the FBS, then Conference USA would be the best option. James Madison is a recent addition to the top level of the FCS. The Dukes have made the playoffs four straight seasons, but the last two put them up with the best. In 2016, they upset the Bison for the National Championship and then followed that up in 2017 with a loss to Bison in the title game. To be fair, this is not the same sustained success as the previous two entrants, but strong enough for consideration. The Dukes currently play in the Colonial Athletic Association, which stretches from Maine to South Carolina. JMU sits at the southern edge of the conference, which might make travel costly depending on the scheduling rotation. JMU, like Sam Houston State, has several options. They could go to the American Athletic, Conference USA, or Sun Belt. James Madison would face the opposite of SHSU’s possibilities for all three. The Dukes would be in the East for the AAC though that would make it unbalanced in terms of natural East and West programs. For C-USA, they would be a natural fit for the East Division while the same would be true for the Sun Belt. James Madison has a solid stadium size already at 25,000, which will make the costs relatively less expensive for expansion. Verdict: James Madison sits in an awkward geographical position for the three conferences above. Conference USA would be the best fit for costs and travel as they would only face a West opponent on the road once every other year. The Jacksonville State Gamecocks have dominated the Ohio Valley Conference with four straight titles. They have made the FCS playoffs five straight seasons with a title game appearance in 2015 (yes, they lost to NDSU). As part of the OVC, Jacksonville State is the southern most member, but it is a comfortable distance to northern most team, Eastern Illinois. The team furthest to the west is Southeast Missouri State on the Missouri-Illinois border, which again, is not too bad. If the Gamecocks were to go to the FBS they too have the options of the AAC, C-USA, and Sun Belt. However, one fits better than the other two and that is the Sun Belt. JSU’s location in northeast Alabama puts them right in the middle of the conference in terms of location. That would make them ideal to be put in either division as needed. Or the Sun Belt could flip the division from east and west to the north and south while also adding another team to have an even number of teams. The JSU stadium can hold 24,000, which will help limit the amount they need to spend on expanding the stadium. Verdict: The Ohio Valley is a decent fit for them, but if they are looking for the FBS, the Sun Belt makes sense. While the AAC and Conference USA are both plausible, the Sun Belt felt most natural. Eastern Washington has also been a mainstay in the FCS Playoffs. Since their National Championship in 2010, they have made the playoffs five times and progressed to at least the quarterfinals on each occasion. Four of the five appearances resulted in a semifinal appearance. The Eagles play in the Big Sky Conference which stretches from Washington all the way to the middle of Arizona and out to the eastern border of North Dakota. As mentioned above, the University of North Dakota will be moving to the Missouri Valley Football Conference and it is not hard to see why when their closest in conference opponent is Northern Colorado. There are two natural destinations for EWU with the Pac-12 and Mountain West. The Pac-12 is a long shot considering they would probably want to see how they perform in the FBS before having them join. So that leaves the Mountain West. The Eagles would probably be put in the Mountain Division, which would require travel to Colorado, Idaho, New Mexico, Utah, and Wyoming. The travel is not horrendous outside of the trip to New Mexico every other year. The west division would be very similar to New Mexico and would also have to be done every other year. The stadium capacity of Roos Field is a paltry 8,600, which means a huge outlay to expand the size. 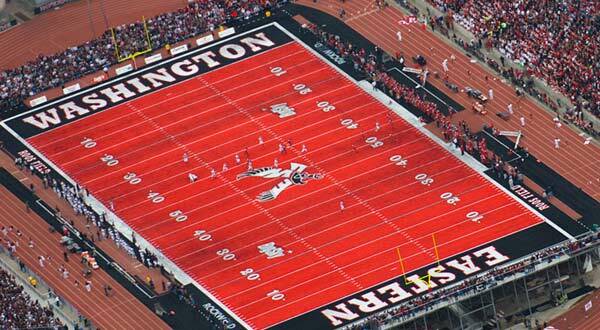 At least their red turf would go along nicely with Boise State’s blue turf. Verdict: The current travel arrangements do not differ much as if they were to play in the Mountain West. The stadium expenditure would probably be another point of concern. The reality is go for Pac-12 money (though unlikely) or stay put in the Big Sky. VCU, currently in the Atlantic 10 for all other sports, would make a wonderful addition to Conference USA. They are located in Richmond, which is the capital of Virginia. That provides a great fan base for any potential team. VCU has not fielded more than a club team for football. In addition, a stadium would be required for the football team making the likelihood of this happening slim. What VCU does have in terms of location also applies to the student body. The Rams have the second highest enrollment in the state (not counting Liberty’s online degree numbers). That provides a solid footing if they choose to pursue adding a football program. There have been some worries expressed by current Athletic Director Ed McLaughlin. He feels that the costs would exceed the revenue generated as noted here. It appears that as long as McLaughlin is at VCU, the Rams will not have a football team without someone donating what is needed. Verdict: Highly unlikely given the current AD and all the startup costs for the program. UT Arlington previously had a football program until 1985 when the constant financial losses caused the school to stop sponsoring the sport. It may be time for the Mavericks to make a comeback to the field. UTA is the fourth largest school in Texas with an enrollment of 42,000 in the football crazed state. Back in 2004, students voted to increase tuition by $2 per semester hour if football was brought back. All good then, right? Well, not quite. The costs would be enormous especially if the ultimate goal is the FBS. The stadium, which currently holds 12,500, would need a massive upgrade to host FBS football games. To pay for the new sport, the cost would most likely go to students in the form of higher tuition as noted above. One area that UTA would not have to worry about is finding a FBS conference. They are part of the Sun Belt in the other sports offered by the school. That is one piece of the puzzle they will not have to worry about if they bring back football. UTA would have good knowledge about the travel costs if they were to play in the Sun Belt. Verdict: Viable but UTA needs to be prudent about the costs and expected revenue so they do not make the same mistake from 1985. That concludes the second part of our series on the FCS to FBS transition. We hope you enjoyed the analysis! Four teams remain in the hunt for the 2016 FCS National Championship. Three of the top four seeds, #1 North Dakota State, #2 Eastern Washington, and #4 James Madison, are alive along with unseeded Youngstown State. All four are worthy of reaching the National Championship for the right to play for the title. The two semifinal games will be played over two days. The first game featuring the five time defending National Champions, North Dakota State, will be played on Friday, December 16. The second game featuring the #2 seed Eastern Washington will be played on Saturday, December 17. Through three rounds, our predictions have gone 18-2. Below are the links to our predictions for the previous rounds along with the record for that round. Below are the predictions for the FCS Semifinal games. We will begin with the Friday game of James Madison at North Dakota State. James Madison has played in two playoff games and they have both been blowouts. They dismantled New Hampshire in the second round 55-22 after a slow first quarter. Bryan Schor threw for 371 yards on 30 of 37 passing for 5 touchdowns and an interception. Their Quarterfinal game against Sam Houston State was even more impressive. They held one of the best offenses in FCS to just 7 points in 65-7 thrashing of Sam Houston State. SHSU’s Jeremiah Briscoe went a horrid 13 of 44 for 143 yards passing and 2 picks. The running game got going for the Dukes with 144 yards and 2 touchdowns from Trai Sharp and 141 yards and 3 touchdowns from Khalid Abdullah. The special teams also had a punt return for a touchdown and blocked another punt that they then returned for a touchdown. North Dakota State opened with San Diego in the second round and they had little trouble with them in a 45-7 win. Easton Stick threw for 208 yards and 3 touchdowns while rushing for another 99 yards. The team averaged 9.6 yards per carry with 299 yards total on the ground. The Bison’s Quarterfinal matchup was against a familiar foe in South Dakota State. The Bison lost to them 19-17 in the regular season and they had a slow start to the Quarterfinal. SDSU took a 10-0 thanks to the hidden ball trick play. After that, the Bison were in total control. They got a 49 yard touchdown run from Lance Dunn (after a 71 yard touchdown pass to Dimitri Williams was taken off the board). Their next drive was a soul crushing 20 play possession that took off 12:09 on the clock. Stick kept the ball for a 3 yard touchdown run and the Bison took a 14-10 lead they never relinquished. The Bison won 36-10 with Stick throwing for 188 yards, 1 touchdown, 1 interception, and rushing for another 83 yards and 2 scores. King Frazier had 101 yards rushing while Dunn finished with 91 yards and a score on the ground. James Madison is full of playmakers on offense with Bryan Schor at quarterback and Khalid Abdullah running the ball. The emergence of Trai Sharp the last three weeks have really helped Dukes on offense. Sharp has 301 yards the last three games, which is more than half of his entire season total (593 yards). The Bison allow 99.2 yards rushing per game. North Dakota State’s offense will probably be the key to this game. The Bison are averaging 290.6 rushing yards per game over their previous five contests. They want to use that run game to wear down the defense, salt the clock, and score touchdowns. They did that very well against South Dakota State and their key was going 10 for 13 on third down. If James Madison wants to have any chance, they need to stop the run, prevent long drives, and, most importantly, get off the field on third down. Easier said than done. This game features two physical teams that prefer to run the ball, but can use the passing attack to beat their opponent if needed. James Madison has the better offense here, but the Bison have the better defense. Who will win that battle? We like James Madison to win this game 31-28. To pick against the Bison, at home, as 5 time defending National Championships, and with a stellar run game, is very hard to do. They could easily make this pick look terrible, but we like the Dukes here. Youngstown State is the only team remaining to have played in the first round. They faced Samford in a game they controlled throughout and won 38-24. Their second round game was against Jacksonville State and they did exactly what they needed to do. They forced Eli Jenkins to throw the ball and he went 6 of 26 passing with 140 yards, a touchdown, and 2 interceptions. The defense gave up 317 yards rushing, but they forced a run first team into a deficit and forced them to pass. Jody Webb finished with 140 yards rushing and 2 touchdowns while Hunter Wells threw for 290 yards and a touchdown on 10 of 18 passing for Youngstown State. The Penguins had a stiff test in the Quarterfinals as well with Wofford coming to town. Wofford took a 9-0 lead after the first quarter, but YSU responded with two touchdowns to make it a 13-9 lead. After that, the teams exchanged scores until late in the game when Youngstown State hit a 32 yard field goal to tie the game at 23. Wofford attempted a 53 yard field goal at the end of regulation, but it came up short and the game went to overtime. Overtime was full of twists and turns. Wofford decided to go for it on fourth and one from the YSU 3, but the pitch hit off Lorenzo Long’s hands and went out of bounds. The Penguins had a chance to win it in the first overtime, but Zak Kennedy’s 37 yard field goal was wide right. YSU started the second overtime with a 2 yard touchdown run by Tevin McCaster and then forced an incompletion on fourth down against Wofford’s offense to seal the 30-23 win in double overtime. Eastern Washington had a bye in the first round and then faced Central Arkansas in the second round. After giving up the first 14 points, the Eagles scored the final 31 points and held the Central Arkansas offense to 75 yards in the second half. Gage Gubrud went 47 of 64 passing with 449 yards and 2 touchdowns in the 31-14 win. He also rushed for 68 yards and a touchdown in a complete performance from him. Eastern Washington used that strong second half defensive performance against Central Arkansas and parlayed that into a full game against Richmond. In their 38-0 shutout, they held Richmond to 205 yards of total offense including 48 yards on the ground and only 1.3 yards per carry. Gage Gubrud had a more pedestrian game going 21 of 32 for 287 yards with 3 touchdowns and a pick. Cooper Kupp caught 6 passes for 128 yards and a score despite worries over his shoulder. The weather for this game is expected to be bitterly cold in Cheney, Washington. That would seem to favor the running attacks, which Youngstown State has a distinct advantage in. The Penguins average 257.1 yards per game on the ground and their playoff average is at 244.7 yards per game. Jody Webb (1,200 yards and 6 touchdowns) and Martin Ruiz (1,153 and 12 touchdowns) are the leading rushers, but Ruiz may not play against an EWU defense that allows 188.4 yards rushing per game. Ruiz played little in the Wofford game after being arrested on firearm charges. Eastern Washington only averages 131.3 yards per game on the ground. Will the weather completely shut down their pass attack? That is difficult to envision because the Eagles will still throw the ball around plenty. However, we saw cold weather shut down Sam Houston State’s offense at James Madison when the weather was cold. The difference here is that Eastern Washington is used to this weather, even if it is not ideal to play in. They know what to expect and should be prepared. One thing to keep in my about this game is that Youngstown State may be without four or five players including Martin Ruiz. If that is the case, their work is going to be even more difficult. Youngstown State has a good offense to play in the cold weather. That is to run the ball, but this Eastern Washington defense has been completely different the last 90 minutes of game time. Gage Gubrud will be able to complete enough passes to the trio of Kupp, Shaq Hill, and Kendrick Bourne. If needed, Gubrud can use his legs to run the ball as he is the leading rusher for the Eagles with 558 yards and 5 touchdowns. We will pick Eastern Washington to win this game 28-17. Check back the first week of the new year for a preview of the FCS National Championship game. The 2016 FCS Playoffs bracket has been cut down to 8 teams. There was some exciting action in the second round and some blowouts as well. The Quarterfinals will be played on both Friday, December 9 and Saturday, December 10. All four games can be found on various ESPN channels. An updated bracket can be found here. After going 7-1 in the first round with our predictions, we matched that again in the second round to move our two round total to 14-2. We will make our predictions for the quarterfinals starting with the #1 seed North Dakota State and #8 South Dakota State. South Dakota State started their playoffs with a 10-7 win at home against Villanova last week. It was an ugly game with the Jackrabbits rushing for just 7 yards. Taryn Christion threw for 190 yards and a touchdown on 20 of 33 passing. The defense allowed 321 yards of offense to Villanova, but allowed just that one score and were stingy once the Wildcats got inside their territory. North Dakota State opened their 5 time title defense with a 45-7 walloping of San Diego at home. Easton Stick threw for 208 yards and 3 touchdowns, ran for another 99 yards on 4 carries, and the rushing attack was devastating. The Bison had 299 yards on 31 carries as a team (Lance Dunn had 93 yards and 1 TD while Bruce Anderson rushed for 61 yards and a TD) and they averaged 9.6 yards per carry. This is a rematch of the game on October 15 that South Dakota State won 19-17 in this building. The Bison held a 17-3 lead midway through the third quarter, but SDSU chipped away at the lead. Christion hit Jake Wieneke from 2 yards out with 1 second left and the Jackrabbits pulled off the upset. The Jackrabbits put up 523 yards of offense that day, which was the second most against NDSU’s defense behind Eastern Washington’s 556 yards in the Bison’s second game. So how will this game go? Probably pretty similar to the first one. The Jackrabbits have the better offense, but the Bison have the better defense. This game will come down to the Bison’s offense. If they can control the clock, shorten the game, and gave success running the ball, then they will probably win. The combination of Dunn, King Frazier, Stick using his legs to extend plays/drives, Chase Morlock, and Anderson will be tough to stop. The Bison had 161 yards rushing in the first game versus SDSU and averaged 4.6 yards per carry. In a close game, we like the North Dakota State Bison to win and move on to the semifinals. They will be tested by Taryn Christion, but will do enough to win 21-16. The winner of this game will play either Sam Houston State or James Madison in the semifinals. Sam Houston State was tested in their second round game at home versus Chattanooga. Despite leading the whole game, the Bearkats needed a late fourth down stop to win 41-36. Jeremiah Briscoe threw for 363 yards and 5 touchdowns with 1 pick on 20 of 40 passing. Yedidiah Louis had 8 catches for 156 yards and 3 touchdowns. The Bearkats put up 421 yards of offense, but it was Chattanooga’s offense who did better with 531 yards. James Madison blew the doors off New Hampshire at home 55-22. After falling behind 7-0 midway through the first, they responded with 31 straight points to take a 31-7 halftime lead. The Dukes had 408 yards passing (Bryan Schor had 371 yards with 5 touchdowns and 1 interception) and 567 yards of total offense. This game will be all about offense. SHSU averages 53.1 points and 570.4 yards per game. James Madison averages 48.3 points and 525.8 yards per game. The defenses are porous with SHSU allowing 26.8 points and 428.5 yards per game while JMU allows 23.3 points and 354.5 yards per game. Sam Houston State and Jeremiah Briscoe can put up points, but can their defense stop the Dukes? They will be motivated going in the road after getting the #5 seed. We like a high scoring game and James Madison to come out on top 48-38. The winner of this game will play either South Dakota State or North Dakota State in the semifinals. Wofford sure knows how to play in close games. They staved off Charleston Southern in round one with a 15-14 victory. In the second round, they went on the road and defeated The Citadel 17-3, but that score is far from how close the game was. The game was tied at 3 after three quarters, then the Terriers took a 10-3 lead after Joe Newman broke off a 36 yard touchdown run. Devin Watson picked off a Citadel pass and returned it 64 yards for a touchdown in the final minute to make it 17-3. The Citadel also missed three of their 4 field goal attempts. Youngstown State dominated Samford 38-24 in the first round with that game’s score flattered by two late Samford touchdowns. The Penguins second round game was more impressive though. They went on the road to Jacksonville State and held them in check during the second half to win 40-24. They allowed 317 yards on the ground to Jacksonville State, but they built a lead that forced them to throw the ball. Eli Jenkins hit only 6 of his 26 pass attempts for 140 yards with 1 touchdown and 2 interceptions. The Penguins finished with 520 yards of offense with 290 yards passing and one touchdown from Hunter Wells and 140 yards rushing and 2 big scores from Jody Webb. Wofford will be running the ball pretty much non-stop in this game. They have averaged 182 yards per game rushing in the playoffs compared to only 38.5 yards passing per game. It will be a heavy dose of Lorenzo Long, who has 1,382 yards and 16 touchdowns on 274 carries this year. In the playoffs, he has 188 yards and 2 touchdowns on 41 carries. Youngstown State allows 117.8 yards rushing per game. Youngstown State is similar to Wofford in that they like to run the ball a lot. However, they have a passing attack that can get the job done if needed. Martin Ruiz (1,149 yards and 12 TDs) and Jody Webb (987 yards and 6 TDs) are the main ball carriers. Hunter Wells had his best game against Jacksonville State with 290 yards passing. The Penguins are facing a Wofford defense that gives up 91.2 yards rushing and 186.4 yards passing per game. If Wofford wants to win this game they will need to stop the run and for Wells to throw the ball. The problem is that since Wells became the starter, he has not had a bad game since the North Dakota State contest. He had 0 touchdowns and three interceptions in his first two starts, but has since thrown 4 touchdowns with no interceptions. Wofford will also want to keep this game very low scoring, which is possible if they can force a lot of three and outs. We like Youngstown State to win this game 24-10. The Penguins will keep Lorenzo Long in check and the offense will score enough points at home to force Wofford into an uncomfortable position. The winner of this game will play either Richmond or Eastern Washington in the semifinals. Richmond opened with an easy 39-10 win over North Carolina A&T in the first round. Their second round game was much more difficult and they needed to mount a fourth quarter comeback to win 27-24. They trailed 24-7 at halftime, but a touchdown pass and touchdown run from Kevin Johnson, along with 2 field goals from Griffin Trau, saw them win as time expired. Eastern Washington had a bye in the first round and won over Central Arkansas in the second round 31-14. It was a different kind of win because they fell behind 14-0, but dominated the game after that. It was the defense that had a strong second half outing allowing just 75 yards in the final 30 minutes. Gage Gubrud threw for 449 yards and 2 touchdowns on 47 of 64 passing. There were concerns about Eastern Washington’s defense going into the game last week, but they way they played after letting up 2 touchdowns was impressive. They are going to have to stop Kevin Johnson, who has 604 yards (66.7%) passing and 3 touchdowns with no picks. Johnson is also a threat to run the ball and keep plays alive, especially near the red zone. The Eagles will need to stop Brian Brown from catching too many passes, but good luck with that. Brown has 77 receptions for 1,441 yards and 11 touchdowns this year. 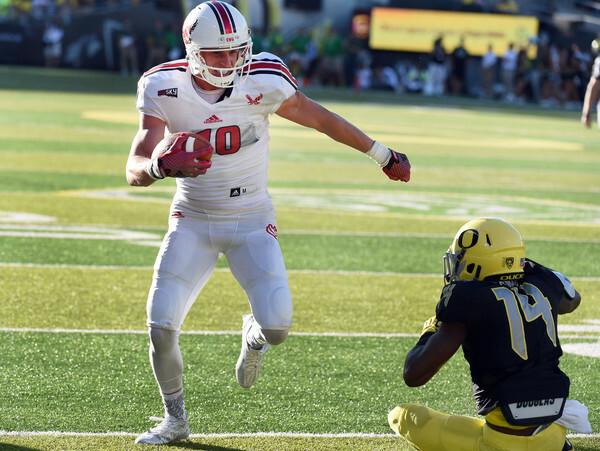 Eastern Washington fans will want to keep an eye on the health of star receiver Cooper Kupp. He started the game despite a shoulder injury and played well catching 10 passes for 95 yards and 2 touchdowns. He did not play most of the second half due to the injury, and his loss for an entire game would be huge. Still, the Eagles can rely on Shaq Hill (72 catches for 1,077 yards and 15 touchdowns) and Kendrick Bourne (74 catches for 1,051 yards and 6 touchdowns) if Kupp cannot play or his action is limited. Richmond is a resilient team and if they can keep this game close, they will not be deterred. It will help if Kupp cannot play for Eastern Washington that will help Richmond. We like Eastern Washington, even if Kupp does not play, to win this game 28-24. The winner of this game will play either Wofford or Youngstown State in the semifinals. Check back next week for predictions for both of the semifinal games in the 2016 FCS Playoffs. The first round of the FCS Playoffs saw eight teams eliminated and the winning teams will be facing the eight teams that had a bye. All the games for the second round will be played on Saturday, December 3. The remaining schedule for the FCS Playoffs can be found at the bottom of this linked article. If not for a vengeful San Diego team, we would have predicted all 8 games correctly from the first round. As it is, we went 7-1 with our predictions for last week’s games. An updated bracket for the FCS Playoffs can be found here. For the predictions below, we will start in the upper left of the bracket where the #1 seed North Dakota State is and work our way around. San Diego went on the road in the first round and got even with the only team to defeat them in the regular season. The Toreros did exactly what they needed to do and that was stop Cal Poly’s rush offense. After allowing 354 yards rushing to Cal Poly in the first matchup, USD allowed just 155 yards on the ground (and only 40 passing) to Cal Poly in the opening round playoff game. They won 35-21 with 296 yards and 2 touchdowns passing from Anthony Lawrence along with 171 yards and 3 touchdowns rushing by Jonah Hodges. North Dakota State had a bye in the opening round after going 10-1 during the regular season. They had wins over Charleston Southern, Eastern Washington, Iowa, Illinois State, Western Illinois, Northern Iowa, and Youngstown State. Their lone blemish was a 19-17 loss to South Dakota State at home thanks to a late passing touchdown by the Jackrabbits. And we have not even mentioned that the Bison are 5 time FCS National Champions. We will not break down the stats: We like NDSU to win at home. The Bison have not been as dominant this year, but they sure do know how to win close games. They are 6-1 in games decided by 8 points or less. We like this one to be outside of that zone with the defense shutting down San Diego’s offense to win 28-10. The winner of this game faces either Villanova or South Dakota State. Villanova had an opening round home game against St. Francis and it was a rather easy game despite the 31-21 score line. Two fourth quarter touchdowns flattered the final tally for St. Francis as Villanova led 31-7 at halftime. Villanova had 495 total yards with Zach Bednarczyk throwing for 254 yards with 3 touchdowns and a pick. South Dakota State had a bye in the opening round after a pretty good regular season. They lost to TCU (59-41 in a good showing by SDSU), Cal Poly (38-31), and Illinois State (38-21). Their wins consist of the 19-17 win at North Dakota State and at home against Youngstown State 24-10. This is an interesting game because Villanova’s offense is not overwhelming (25.8 points and 383.6 yards per game), but SDSU’s defense can give up points and yardage at 28.4 points and 403.4 yards per game. On the other side, Villanova’s defense is very good at 15.4 points and 265 yards per game but they will be strained by SDSU’s offense that averages 37.4 points and 481.7 yards per game. Can Bednarczyk keep the turnovers down (10 interceptions this year) and can the Villanova rush attack get going against the SDSU defense? The numbers say yes, but SDSU may have something to say about that. SDSU will use the arm of Taryn Christion to get the offense down the field. He has 3,369 yards (64.1%), 29 touchdowns, and 8 picks along with 385 yards rushing and 6 touchdowns. This game feels like a shootout that could go either way. We will go with South Dakota State to win 41-38. The winner of this game play either San Diego or North Dakota State in the quarterfinals. Chattanooga opened the playoffs at home with a convincing 45-14 win over Weber State. Derrick Craine ran for 160 yards and a touchdown while Montrell Pardue returned a fumble 99 yards for a score to blow the game wide open (was 17-0 prior to the score). Sam Houston State was the only FCS team to go undefeated in the regular season and did so in style. All of their wins were by double digits, but the offense is the main attraction. They averaged 54.2 points and 584 yards per game! Jeremiah Briscoe had a spectacular season with 4,096 yards and 52 touchdowns passing. He only threw 7 picks out of 419 attempts and completed 67.3 % of his passes. The real question in this game is how well will the Chattanooga defense play? They are good giving up only 17.8 points and 283.4 yards per game and they have big game experience recently against a strong offense (see the game at Alabama where they gave up 332 yards to the Tide). There is also the anger factor for SHSU. The Bearkats were awarded the 5th overall seed, but felt they deserved a higher seed (and potentially another home game). We are going with the Sam Houston State Bearkats at home 51-41 in another high scoring game. The winner of this game will play either New Hampshire or James Madison in the quarterfinals. New Hampshire had a fun time against Lehigh in the first round winning 64-21. The Wildcats put up 637 yards of total offense (364 of them on the ground), Adam Riese threw for 273 yards with 3 touchdowns and 3 picks, Dalton Crossan rushed for 184 yards and 2 scores, and Trevon Bryant had 113 yards rushing and 2 touchdowns. James Madison had a bye in the first round after a 10-1 season where they went undefeated in the Colonial. Their lone loss was at North Carolina 56-28 where they were hanging around for the better part of three quarters. This is also a rematch of the game on October 15 in New Hampshire. The Dukes had a massive 42-14 lead with 10 minutes left, but a furious rally by the Wildcats came up just short and they lost 42-39. The Wildcats threw for 512 yards in the loss (largely due to playing from behind), while the Dukes had 437 yards. Bryan Schor threw for 264 yards and 4 touchdowns with no picks for James Madison. Adam Riese came off the bench to throw for 198 yards and 2 touchdowns for New Hampshire. Like the game in October, this one might be high scoring. Neither defense is strong as they both give up more than three touchdowns and 350 yards per game. Watch to see how Dalton Crossan does this time around. He rushed for only 35 yards (and a score) on 13 carries in the first game. If he cannot get going again, it might be another big deficit for the Wildcats to overcome. We are going with the better offense to win here in James Madison. 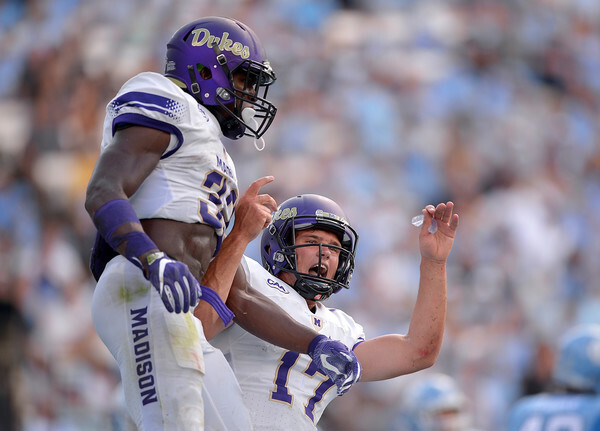 The Dukes average about 19 points and 140 yards per game more than New Hampshire. James Madison wins this rematch at home 45-31 (it could be even higher if neither defense shows up a la Syracuse and Pitt). The winner of this game faces the winner of the Chattanooga and Sam Houston State contest. Youngstown State started the playoffs with a 38-24 win at home over Samford. It was a pretty comfortable game after a score midway through the fourth quarter made it 24-7. Samford scored two touchdowns in the final 7 minutes to make the score line look closer than it was. Jody Webb rushed for 174 yards and 2 touchdowns while the defense allowed only 24 yards rushing. Jacksonville State had a bye in the opening round and their only loss was at LSU in week two. The Gamecocks kept the game close until the final 70 seconds of the first half when they allowed two touchdowns and the deficit ballooned from 3 points to 17. YSU’s Hunter Wells has been serviceable the last five games in replace of the normal starter Ricky Davis. Wells has thrown for 746 yards (63.2%) with 3 touchdowns and 3 interceptions. It is really going to come down to Martin Ruiz (1,086 yards and 11 touchdowns) and Jody Webb (847 yards and 4 touchdowns) running the ball. They are up against the Jacksonville State rush defense that allows 78.8 yards per game, but they must get going to keep the pressure off Wells. This Jacksonville State team does not have the explosive offense as we have seen in recent years, but this offense is still pretty good with Eli Jenkins back for his last playoff run. He has 1,967 yards (52.3%) with 10 touchdowns and 6 picks, but his running ability is what really gives defense headaches. He has 795 yards and 12 touchdowns and he will spread the ball to Roc Thomas (782 yards and 7 TDs) and Josh Clemons (731 yards and 9 TDs). Those three will dictate how the run game, and JSU’s offense, will perform in this game. Youngstown State allows 101.2 yards per game on the ground. It appears that whichever running attack is most productive will win this game. We like that team to be Jacksonville State with the Gamecocks winning 34-21. The winner of this game will play either Wofford or The Citadel in the quarterfinals. The Wofford Terriers played in a dog fight the opening round (pun intended) at home against Charleston Southern. They won 15-14 in a game that truly could have turned on one play. It was an ugly game if you like offense: CSU had 286 yards to 185 for Wofford. The passing games were sparsely used (as expected with run-heavy offenses) with a combined 135 yards passing from the two teams. Lorenzo Long earned every single one of his 96 yards and 2 touchdowns on 27 carries. The Citadel earned a bye for the opening round after winning the Southern Conference. They defeated Chattanooga (22-14) and Samford (37-24) at home along with Wofford on the road (24-21). Their only loss was at North Carolina when they were crushed 41-7. However, they racked up 344 yards on the ground against the Tar Heels. When these two teams met on October 22nd, overtime was needed. The Citadel settled for a field goal in the first part of overtime and then forced a fumble and recovered it on Wofford’s offensive possession to win the game. 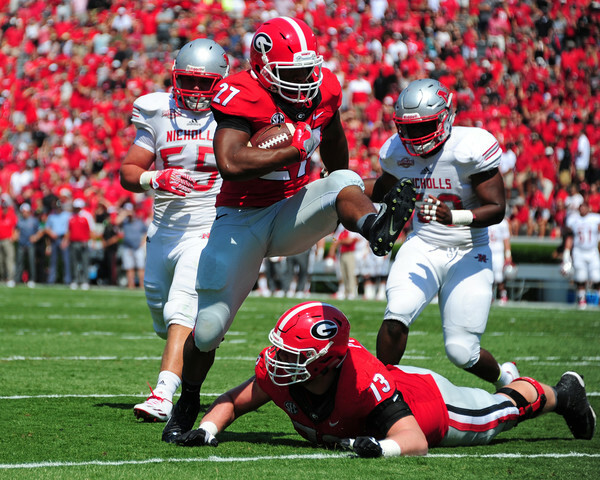 Wofford won the rushing battle that day 299 to 190 with Long rushing for 103 yards. The difference was turnovers. Wofford lost 3 fumbles (one led to a touchdown and the other ended the game) and also had an interception returned for a touchdown. This will be another game with a lot of running as both teams average less than 75 yards passing per game. Wofford averages 282.9 yards rushing per game compared to 358.5 per game for The Citadel. Wofford relies mostly on Lorenzo Long for their rushing as he has 1,290 yards and 16 scores. He is the key for both Wofford’s offense and The Citadel’s defense. The Citadel has a 4 headed rushing attack with Tyler Renew (1,020 and 4 TDs), Cam Jackson (656 yards and 5 TDs), Reggie Williams (650 yards and 4 TDs), and Dominique Allen (601 yards and 7 TDs). This will be another dog fight, literally, between the Wofford Terriers and The Citadel Bulldogs. Wofford had control of the first game between these teams, but lost because of mistakes. If they can repeat that game, minus the mistakes, they will win. We like Wofford to win 17-14. The winner of this game will face either Youngstown State or Jacksonville State. Richmond rolled to a first round victory at home against North Carolina A&T, 39-10. The Spiders had 491 yards of offense, but most importantly held Tarik Cohen to 70 yards on 13 carries and the Aggies to 226 yards of offense. Kevin Johnson threw for 315 yards with 1 touchdowns and no picks. North Dakota received a bye after going 9-2 during the regular season. Their losses came in the first two weeks on the road against Stony Brook (13-9) and Bowling Green (27-26). After that, they defeated South Dakota (47-44 in double overtime), Cal Poly (31-24), and Weber State (27-19) en route to 9 straight wins. Both teams look similar in the stat columns: Richmond averages 31.2 points per game compared to 30.1 for UND. On defense, the Spiders give up 22.2 points per game while UND allows 21.5. The differences are Richmond allows less yardage per game on defense (305.2 to 353.2), posts more yards per game on offense (429.7 to 391.8), and prefers to pass the ball while UND likes to run the ball. Kevin John will be the key for Richmond as Kyle Lauletta is out for the playoffs. Lauletta had 3,022 yards (63%) with 24 touchdowns and 8 picks on the season prior to his injury. Even if the rushing attack is not working, he can still pick apart defenses. His main target is Brian Brown, who has 70 catches for 1,254 yards and 10 scores. The North Dakota rushing attack is led by John Santiago (924 yards and 7 TDs), but we will also see plenty of Brady Oliveira (837 yards and 9 TDs). They will need to soften up the defensive rush for Keaton Studsrud. He has only 1,816 yards (56.6%) with 12 touchdowns, but he does not turn the ball over much with two interceptions and one lost fumble on the year. We like the Richmond passing attack to have success against North Dakota’s pass defense that allows 261.6 yards per game. The Spiders take this one 34-26. The winner of this game will play either Central Arkansas or Eastern Washington. What a fourth quarter Central Arkansas had in the first round against Illinois State. They entered the quarter down 17-7, but blocked a punt and returned it a short 4 yards for a touchdown. After scoring a touchdown on their next drive, they went for an onside kick (up 21-17) and recovered it. They made it 24-17, but let up a 55 yard pass to see the game tied at 24 with 6:15 left in the game. They took the lead for good thanks to Antwon Wells‘ 4 yard touchdown run to win 31-24 after scoring 24 fourth quarter points. Eastern Washington had a great regular season. They defeated Washington State on the road to start the year 45-42, but lost a tough one to North Dakota State on the road the following week, 50-44. They secured wins over Northern Iowa (34-30), Northern Colorado (49-31), the Montanas (even though they both had a subpar season), and Cal Poly (42-21). Central Arkansas does not have the offense that EWU has with 34.7 points per game versus 44.2, but they have the better defense, at least according to the stats. They allowed 20.9 points per game (28.8 for EWU) and 320.1 yards per game (443.6 per game for EWU). Quarterback Hayden Hildebrand (2,936 yards, 60.7% completions, 19 touchdowns, and 9 picks) is facing a defense that allows 237.1 yards per game through the air. Even the rushing attack, which does not have a go-to back, could see some success against the Eagles rush defense that gives up 206.5 yards per game. If Eastern Washington will win this game, it will have to be on offense. And they sure can do it with Gage Gubrud running the show. He has 4,071 yards (68%) with 40 touchdowns and 11 interceptions. He also leads the team in rushing with 463 yards and 4 touchdowns. It does not hurt to have one of the best receivers in the FCS (feel free to name a better receiver) in Cooper Kupp. Kupp has 91 catches for 1,297 yards and 12 scores. One of his partners is Shaq Hill, who has some good numbers of his own with 65 catches for 1,014 yards and 15 touchdowns. The fearsome trio is rounded out by Kendrick Bourne who has 61 catches for 925 yards and 6 touchdowns. This has all the makings of a shootout. Central Arkansas will have success against the Eastern Washington defense. Will the Bears defense have an answer for trio of Eagles receivers? We think EWU does enough on offense to get the win, but Gage Gubrud will need to avoid turnovers to do so. Eastern Washington takes this one 52-49. The winner of this game will play either Richmond or North Dakota. Here are the picks for the eight games: North Dakota State, South Dakota State, Sam Houston State, James Madison, Jacksonville State, Wofford, Richmond, and Eastern Washington. Check back next week for the FCS Playoff quarterfinal predictions. The 24 teams in the 2016 FCS Playoff Bracket were announced and the usual heavy hitters are in the field. North Dakota State is the reigning five time National Champions and they were awarded the #1 overall seed. The bracket can be found here via the NCAA’s website. The top four seeds, in order, are North Dakota State, Eastern Washington, Jacksonville State, and James Madison. Seeds five through eight, in order, are Sam Houston State, The Citadel, North Dakota, and South Dakota State. The top 8 seeds all receive a bye into the second round with those games to be played on December 3. Overall, four different conferences had four teams in: Big Sky, Colonial Athletic, Missouri Valley, and Southern Conference. All games for the first round will take place on Saturday, November 26. We will list all those games along with their start time as well as the second round opponent. San Diego (9-1) at Cal Poly (7-4) – 7 PM Eastern. The winner of this game will play at #1 North Dakota State on December 3. St. Francis (PA) (7-4) at Villanova (8-3) – 2 PM Eastern. The winner of this game will play at #8 South Dakota State on December 3. Weber State (7-4) at Chattanooga (8-3) – 2 PM Eastern. The winner of this game will play at #5 Sam Houston State on December 3. Lehigh (9-2) at New Hampshire (7-4) – 2 PM Eastern. The winner of this game will play at #4 James Madison on December 3. Samford (7-4) at Youngstown State (8-3) – 5 PM Eastern. The winner of this game will play at #3 Jacksonville State on December 3. Charleston Southern (7-3) at Wofford (8-3) – 2 PM Eastern. The winner of this game will play at #6 The Citadel on December 3. North Carolina A&T (9-2) at Richmond (8-3) – 2 PM Eastern. The winner of this game will play at #7 North Dakota on December 3. Illinois State (6-5) at Central Arkansas (9-2) – 2 PM Eastern. The winner of this game will play at #2 Eastern Washington on December 3. National Championship – Will be played on Saturday, January 7, 2017 at Toyota Stadium in Frisco, Texas. Check back later in the week for predictions for the first round of the 2016 FCS Playoffs. Perhaps you heard the North Dakota State Bison defeated the #13 Iowa Hawkeyes 23-21 on Saturday. The Bison went in as 14.5 points underdogs and defeated the mighty Iowa team that went 12-2 and played in the Rose Bowl last season. 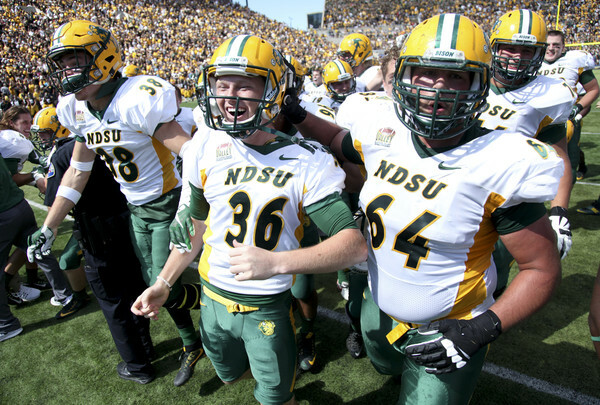 This was the sixth straight victory for North Dakota State over an FBS opponent. Below is the North Dakota State record and future games versus FBS teams. So how does North Dakota State consistently defeat their FBS foes? Well, let’s take a closer look. Below are the averages between the Bison and their last six FBS opponents, which happens to be their current win streak against the FBS. So how do the Bison defeat six straight FBS teams? Stop the run, force third and long situations, control the ball, and win the turnover battle. First, the Bison like to stop the run and that is clear from the rushing yards given up (85.5 per game) and yards per carry average (2.9 per attempt). In fact, their highest rushing total allowed in the six games was 168 yards to Minnesota in 2011. Every other game has seen the Bison allow no more than 102 yards. The highest total yardage allowed by NDSU in the six games was 321 to Kansas State in 2013. The other five games all saw the Bison hold their opponent to fewer than 300 yards. Notice at the bottom of the picture where it mentions the average yards to go on third down. Some calculations were needed, but the end result is clear: the Bison like to get their opponent in third and long, which becomes and obvious passing down. Common sense says it is a lot easier to prepare when you know what is coming from the other offense. The Bison also did better to defend third down as well allowing roughly 36% (4.5 converted out of 12.5 on average per game). The Bison converted about 50% of their third downs on offense, which helps immensely with time of possession. Next up is controlling the ball and the Bison do this incredibly well. They held the ball for an average of 60% of the game and that is not an aberration. They won the time of possession battle in all six victories and the last four (Colorado State, Kansas State, Iowa State, and Iowa) saw them hold the ball above their 60% average. The longer NDSU holds the ball, the longer the opposing defense stays on the field and gets tired. Tiredness can lead to mistakes and frustration. It is demoralizing for a defense to be constantly battered without much rest and the Bison are great at this part. Finally, we have reached the turnover part. The averages say the Bison have less than one turnover per game compared to two for their FBS opponent. Turnovers lead to more possessions, which leads to higher time of possession, more running, and basically everything NDSU loves to do. The Bison have not been perfect as they registered one turnover in four of the six games. The difference? The Bison never lost the turnover battle in the six wins and their “worst” result was against Iowa on Saturday when both teams finished with one turnover. There is still more to the puzzle that is part of the blueprint, but they are not separated out in the box score. Those pieces would be the coaches game plan and execution by the players. How do you account for the things coaches see on film? How about when the player is in the right spot at the right time? Sure, it might end up as a turnover, but what about a blitz that is called out and picked up or a certain formation that is run? The Bison have been well prepared by Craig Bohl and Chris Klieman, but the players deserve credit for their execution too. They did not become 5-time FCS National Champions solely due to luck or by accident. The light did not go on watching the North Dakota State-Iowa game as to how similar this game was to the Kansas State victory in 2013. NDSU took a 7-0 lead in the first quarter in both games, K-State and Iowa both responded by scoring at least two touchdowns, and the Bison needed a score late in the game to win. In addition, North Dakota State came in as a double digit underdog and reigning FCS Champions. While the overall story arc was similar between the two games, some of the stats (and execution by the Bison) were as well. 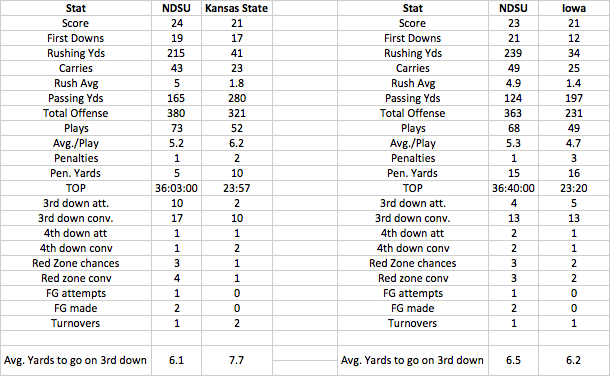 Below are the game stats for both North Dakota State at Kansas State in 2013 and North Dakota State at Iowa on September 18. Look at those rushing stats. The Bison averaged 227 yards per game and gave up only 37.5. 37.5 yards per game against two upper level Power 5 conference opponents. Look at the time of possession. NDSU held the ball for 60%+ in each game. 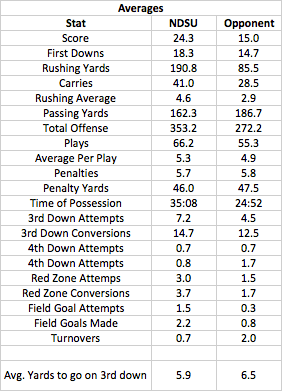 They ran about 40% more plays while also committing a grand total of 2 penalties for 20 yards in the two games. Coincidentally, the scores were nearly identical at 23-21 against Kansas State and 24-21 against Iowa. Want to consistently pull upsets like North Dakota State? There is the blueprint and all you need to do is execute it like the Bison. Easier said than done. Let’s enjoy this incredible run by the Bison both against FBS teams and in the FCS because these type of streaks do not happen very often.